As last summer ended, and the cool weather began, I found myself with an abundance of green tomatoes that needed to be used up. 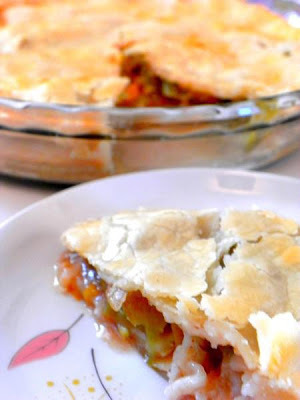 I turned to Mom's Pantry members and Ted Tuck graciously offered to share his mother's recipe for Green Tomato Pie. It isn't hard to figure out why it is a family favorite. The end result is a tasty dish that resembles apple pie in taste. I can't recommend this one enough. Roll out bottom crust (arrange in dish) and refrigerate. In a bowl, stir together the sugar, salt, cinnamon and vanilla. Stir in the tomatoes. Pour the tomato mixture into the bottom crust, dot with butter. Arrange top crust over top and seal and crimp the edges. Vent the top crust, (Mom just cut a large X in the center) Brush the flat portion of the top crust (not the edges) with egg wash.
(Mom taught me this. It works on this one and almost all fruit pies.) Before you heat your oven place one oven rack on the bottom, the other in the center. Place your pie on the bottom rack and bake for 20 minutes. Move to center rack and bake for 20 more minutes. Cover the edges with foil and bake 20 more minutes. (Until top crust is brown and bottom crust is golden.